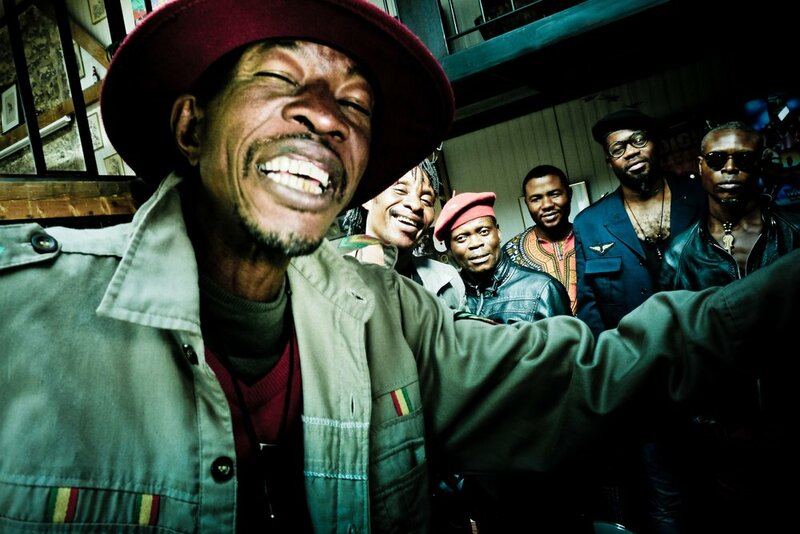 With their second album Kin Sonic, Jupiter and Okwess transcend the Congo’s unexplored musical heritage and dive into a pool of modernity. Jean-Pierre Bokondji, aka « Jupiter », a sort of ghetto Don Quixote, (or a lanky wading bird dressed in a general’s uniform), was born on the 16th December 1963, in Kinshasa. From East Berlin (where he grew up) to Kinshasa, from James Brown to the ultra-dominant Congolese rumba style, Jupiter decided to create his own mode of musical expression. Just like the writing of the African philosopher, Zamenga Batukezanga, Jupiter’s lyrics focus on the painful past, and how to overcome it. Gathered around Jupiter are the Okwess faithful: Montana (of Staff Benda Bilili) on drums and Yendé on bass, guitarists Eric and Richard and the singer Blaise.